EverGreen’s newest and largest travel trailer is the 35RL DS. It features a huge, room-expanding, 42-inch slide-out that is 6 inches larger than its competitors’ 36-inch slide-outs. The EverGreen four-point, gear-driven slide-out is engineered to simultaneously open and close all corners. This provides a tighter seal when closed and ultra smooth operation far superior to conventional two-point cable systems. “We are very pleased with the initial reactions we’re getting from both the sales team and our dealer partners on the Deep Slide models,” adds Lantz. This extra space is packed with amenities like a 90-inch U-shaped dinette with a free standing table, countertop extensions and a larger side aisle bathroom. An air mattress hide-a-bed sofa is available to make room for two more campers. The fresh water and holding tanks have a larger capacity to accommodate additional campers. Fifteen-inch wheels are standard with optional 16-inch available. To ensure stability for these heavier trailers EverGreen builds the DS units on an 8-inch frame. The models sit slightly higher so it is three steps up to the luxurious cabin. The full feature travel trailer weighs just 6,500 pounds and can be towed with a three-quarter ton pickup. The overall weight of the deep slide models is still 20 percent lighter than competitors. There are two additional deep slide models available: the 34BH-DS and the 34BHK-DS. 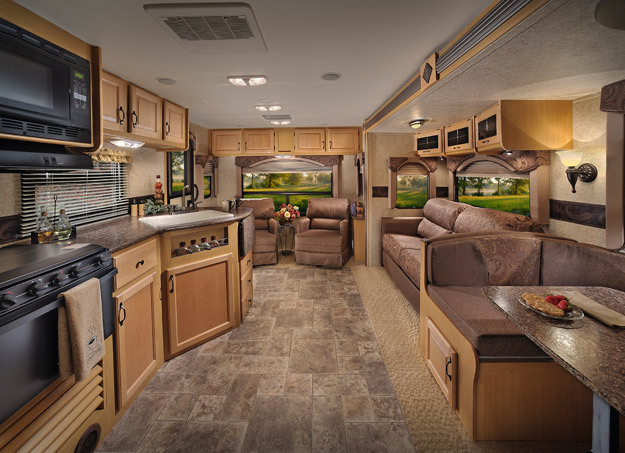 These models feature the bunk beds in the rear of the coach with the BHK model featuring the brand new EverGreen Campfire Kitchenette.